Golf is a strange game. It is essentially a game that involves hitting a ball with a stick. Actually, there are two quotes that I think sum it up quite nicely. 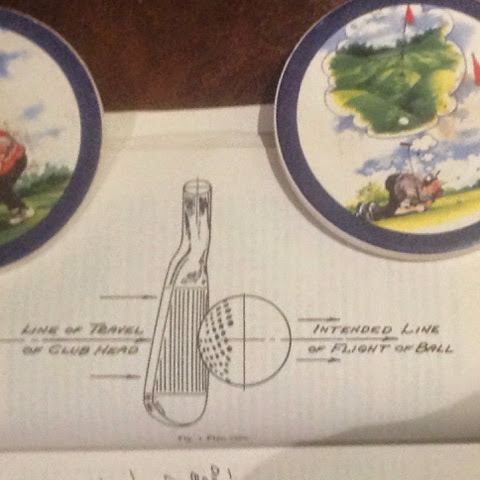 Winston Churchill said that golf involved hitting a very small ball into an even smaller hole with weapons singularly ill-designed for the purpose. An unknown author wrote that golf involves two of America's favourite pastimes; taking long walks in the woods and hitting things with a stick. Hitting a golf ball should be much easier than hitting a baseball, or a tennis ball, because the ball isn't moving when you hit it. How hard can it be? Hell, you should be able to train a monkey to do it. And yet, golfers are constantly tying themselves up in knots trying to figure out how to properly and consistently hit that little white pill. Perhaps that really is the problem with golf; the ball is just sitting there. We are supposed to be in control. We get to decide when to hit it. We get to decide how we want to hit it and where we want to hit it. The ball reacts to us, rather than us reacting to it, as in baseball or tennis. So what's the problem? Moe Norman said that you just hit this dumb thing (the ball), with that dumb thing (the club), over there(the target). He thought it was easy. And actually, when you have that sort of clarity of mind and purpose, it probably was easy for Moe. But Moe Norman didn't just have clarity of mind, he hit literally millions of golf balls with that clarity of mind. So maybe golf is only easy, if it is ever easy, after you've devoted countless hours digging it out of the dirt; finding a swing that works. There is no shortcut to golfing greatness. It involves the kind of devotion and hard work that surely most of us just aren't prepared for. Nor should we be. Unless we have dreams of playing the tour, we should be content to find a swing that gets the job done for us and then go have fun. Today we see the best players in the world, almost without exception, thinking they need a teacher, or a coach, to keep them on track. If they, as professionals, with the time and opportunity to hit hundreds, if not thousands, of balls every week, actually really need help figuring out how to hit the ball properly, what sort of chance do we have? Tiger Woods, arguably the greatest player ever, and certainly the greatest player of his generation by a significant margin, has been going from one instructor to another searching for his swing. Hell, that's like Picasso, after becoming famous, deciding to go to art school to work on his technique. Tiger should be teaching them, not the other way around. I like Lee Trevino's philosophy on teachers. He wouldn't let anyone teach him unless they could beat him. That certainly narrowed the field as far as candidates for the job were concerned. Bobby Jones pointed out that golf is a game that gets more difficult the longer you play it. One reason for that seems to be that golf seems to involve a lot of time spent searching for a swing, or a swing thought, that works for us, only to find that the next time out whatever seemed to work doesn't work any more. Golf is a constant search for perfection, only to then realize, at the end of the day, perfection is but a dream. For the average player, utility is the best we should be hoping for, forget about perfection. If you can find a way to put the club on the ball that generally results in a useable shot, stop searching and go learn how to play. We need to go out every day and find our swing; the swing that will best allow us to gain a modicum of control over that little white ball that just sits there waiting for us to hit it. We're going to feel different every day and so we will just have to commit to every day finding something that seems to work, and then sticking with it until it stops working. The best advice is Moe's. Just hit the dumb ball, with the dumb club, over there. It is the "over there" part that is important. We aren't just trying to hit the ball. That's easy enough after a bit of practice. It is the control of the ball that is the issue. So we have to find the way that works best for us to make that ball behave and go where we want it to. Just look at the swings of the greats. Their swings are as unique to them as their signature. They can be copied or imitated, but their swing belongs to them alone. They have the copyright. 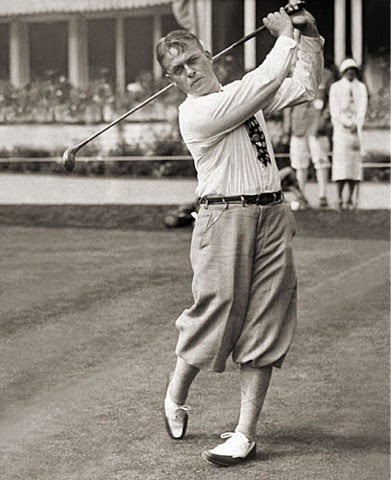 Would we teach someone to swing like Arnold Palmer, Raymond Floyd, Lee Trevino or Moe Norman? We actually do teach people to swing like Moe Norman, so I guess we would. But the reality is, if you didn't hear the sound of the club striking the ball and see the results, you might think Moe Norman, Lee Trevino, or Arnold Palmer were just hackers like the rest of us watching them swing the club. Their swings are not syrupy and sweet like Bobby Jones, Sam Snead or Freddie Couples. They certainly aren't textbook swings. But the results speak for themselves. As Harvey Penick said, pretty is as pretty does. It's all about the results. There are no style points in golf. I am reminded of one of my favourite golfing buddies who is always working at making a "good swing." When we play, he often hits it and then looks over and asks me how that swing was. My usual response is that it looks good to me, because it usually does, but of course the issue is not the swing, it's where the ball went. If you hit the ball where you were looking, it was a good swing even if you looked like you were falling off a ladder when you struck it. It isn't really about the swing anyway, it's the strike that's all important. We tend to get all caught up in the mechanics of the swing, when in reality it's all about the moment of truth; when the ball is struck. If your club is square to the target and moving down the target line with reasonable speed when you strike the ball, you must hit a good shot, even if you happen to look less than graceful while doing it. Don't fall into the trap of working too much on your swing. If you must work on something, better to work on impact; the strike. It's all about impact. In fact, all the great golfers look pretty much the same at impact. Keep in mind the story of Bobby Jones, who once asked his mentor, Stewart Maiden, about his backswing. Maiden replied, like a typical, no nonsense Scottish pro, "You don't hit the ball with your backswing, laddie." Forget the mechanics of the swing. Just hit the dumb thing over there.